Names in bold face represent current Korf Lab members at the time of submission/publication. Lockwood, S.H., Guan, A., Yu, A.S., Zhang, C., Zykovich, A., Korf, I.F., Rannala, B., and Segal, D.J. The Functional Significance of Common Polymorphisms in Zinc Finger Transcription Factors G3. June 26 2014. Beitel C.W., Froenicke, L., Lang, J.M., Korf, I.F., Michelmore, R.W., Eisen, J., Darling, A.E. Strain- and plasmid-level deconvolution of a synthetic metagenome by sequencing proximity ligation products Peer J. 2:e415. Gaulke CA, Porter M, Han YH, Sankaran-Walters S, Grishina I, George MD, Dang AT, Ding SW, Jiang G, Korf I, and Dandekar S. Intestinal epithelial barrier disruption through altered mucosal microRNA expression in HIV and SIV infections., Journal of Virology, 2014, Epub ahead of print, March. Lott, P.C. and Korf, I. StochHMM: a flexible hidden Markov model tool and C++ Library., Bioinformatics, 2014, Epub ahead of print, January. Lemay, D., Pollard, K.S., Martin, W.F., Zadrowski, C.F., Hernandez, J., Korf, I., German, J.B., Rijnkels, M. From Genes to Milk: Genomic Organization and Epigenetic Regulation of the Mammary Transcriptome, PLOS ONE, 2013, 26 September. Parra, G., Bradnam, K., Rose, A. and Korf, I.. Comparative and functional analysis of intron-mediated enhancement signals reveals conserved features among plants. Nucleic Acids Research, 2011. Blahnik, K.R., Dou, L., Echipare, L., Iyengar, S., O'Geen, H., Sanchez, E., Zhao, Y., Marra, M.A., Hirst, M., Costello, J.F., Korf, I., and Farnham, P.J. Characterization of the contradictory chromatin signatures at the 3' exons of zinc finger genes. PLoS One, 2011, 6, 2, e17121. Kovach, A., Wegrzyn JL, Parra G, Holt C, Bruening GE, Loopstra CA, Hartigan J, Yandell M, Langley CH, Korf I, Neale DB. The Pinus taeda genome is characterized by diverse and highly diverged repetitive sequences BMC Genomics, 2010, 11, 420. Blahnik, K.R., Dou, L., O'Geen, H., McPhillips, T., Xu, X., Cao, A.R., Iyengar, S., Nicolet, C.M., Ludascher, Korf, I., and Farnham, P.J. Sole-Search: an integrated analysis program for peak detection and functional annotation using ChIP-seq data. Nucleic Acids Research, 2010, 38, 3, e13. Zykovich, A., Korf, I., and Segal, D.J. Bind-n-Seq: high throughput analysis of in vitro protein-DNA interactions using massively parallel sequencing. Nucleic Acids Research, 2009, 37, 22, e151. Parra, G., Bradnam, K., Ning, Z., Keane, T., and Korf, I.. Assessing the gene space in draft genomes. Nucleic Acids Research 2009, 37, 1, 289-297. Cantarel, B. Korf, I., Robb, S., Parra, G., Ross, E., Moore, B., Holt, C., Alvarado, A., Yandel M. MAKER: An easy-to-use annotation pipeline designed for emerging model organism genomes. Genome Research. 2008, 18, 188-196. Rose, A, Elfersi, T, Parra G, Korf I. Promoter-Proximal Introns in Arabidopsis thaliana are enriched in dispersed signals that elevate gene expression. Plant Cell 2008, 20:543-551. Bradnam, K, Korf I. Longer First Introns Are a General Property of Eukaryotic Gene Structure. PLoS One 2008, 3(8), e3093. Parra G, Bradnam, K, Korf I. CEGMA: a pipeline to accurately annotate core genes in eukaryotic genomes. Bioinformatics 2007, 23(9):1061-1067. Ghedin E. et al. (including Korf I.) Draft Genome of the Filarial Nematode Parasite Brugia malayi Science 2007 317, 5845, 1756-1760. Hajarnavis A, Korf I, Durbin R. A probabilistic model of 3' end formation in Caenorhabditis elegans. Nucleic Acids Research, 2004, 32:3392-3399. Korf I. Serial BLAST searching. Bioinformatics. 2003 Aug, 12;19(12):1492-6. Flicek P, Keibler E, Hu P, Korf I, Brent MR. Leveraging the mouse genome for gene prediction in human: from whole-genome shotgun reads to a global synteny map. Genome Res. 2003 Jan;13(1):46-54. Mouse Genome Sequencing Consortium. The Initial Sequencing and Comparative Analysis of the Mouse Genome. Nature. 2002 Dec 5;420(6915):520-62. Jason E. Stajich, David Block, Kris Boulez, Steven E. Brenner, Stephen A. Chervitz, Chris Dagdigian, Georg Fuellen, James G.R. Gilbert, Ian Korf, Hilmar Lapp, Heikki Lehv?aiho, Chad Matsalla, Chris J. Mungall, Brian I. Osborne, Matthew R. Pocock, Peter Schattner, Martin Senger, Lincoln D. Stein, Elia Stupka, Mark D. Wilkinson, and Ewan Birney. The Bioperl Toolkit: Perl Modules for the Life Sciences. Genome Res. 2002 12(10): 1611-1618. Wendl MC, Korf I, Chinwalla AT, Hillier LW. Automated processing of raw DNA sequence data. IEEE Eng Med Biol Mag. 2001 Jul-Aug; 20(4): 41-8. Korf I, Flicek P, Duan D, Brent MR. Integrating genomic homology into gene structure prediction. Bioinformatics. 2001 Jun;17 Suppl 1:S140-8. International Human Genome Sequencing Consortium. Initial sequencing and analysis of the human genome. Nature. 2001 Feb 15;409(6822):860-921. Korf I, Gish W. MPBLAST : improved BLAST performance with multiplexed queries. Bioinformatics. 2000 Nov;16(11):1052-3. Bedell JA, Korf I, Gish W. MaskerAid: a performance enhancement to RepeatMasker. Bioinformatics. 2000 Nov;16(11):1040-1. Barbazuk WB, Korf I, Kadavi C, Heyen J, Tate S, Wun E, Bedell JA, McPherson JD, Johnson SL. The syntenic relationship of the zebrafish and human genomes. Genome Res. 2000 Sep;10(9):1351-8. Ellsworth RE et al. Comparative genomic sequence analysis of the human and mouse cystic fibrosis transmembrane conductance regulator genes. Proc Natl Acad Sci U S A. 2000 Feb 1;97(3):1172-7. Marth GT, Korf I, Yandell MD, Yeh RT, Gu Z, Zakeri H, Stitziel NO, Hillier L, Kwok PY, Gish WR. A general approach to single-nucleotide polymorphism discovery. Nat Genet. 1999 Dec;23(4):452-6. Dunham I et al. The DNA sequence of human chromosome 22. Nature 402(6761): 489-495 (1999). The C. elegans Sequencing Consortium. Genome sequence of the nematode C. elegans: a platform for investigative biology. Science 282: 2012-2018 (1998). Korf I, Fan Y, Strome S. The Polycomb group in Caenorhabditis elegans and maternal control of germline development. Development. 1998 Jul;125(13):2469-78. Jun 26, 2015: Keith Bradnam is interviewed by Frontline Genomics Magazine about his life in Bioinformatics. Apr 8, 2015: Ian Korf is quoted in a Nature commentary article about Bioinformatics Service cores and the need for beter career paths for bioinformaticians. Mar 16, 2015: Danielle Lemay is interviewed by the UC Davis News team about the new publication by herself, Kristen Beck (lead author), Ian Korf and others that describes new milk proteomes for human and macaque. Dec 10, 2013: A short piece in the UC Davis Alumni Magazine that discusses the new Genomics undergraduate major that Ian Korf co-developed. Nov 1, 2013: Keith B. and Kristen are both featured in a piece on Inquiring Minds as part of the new One UC Davis campaign. 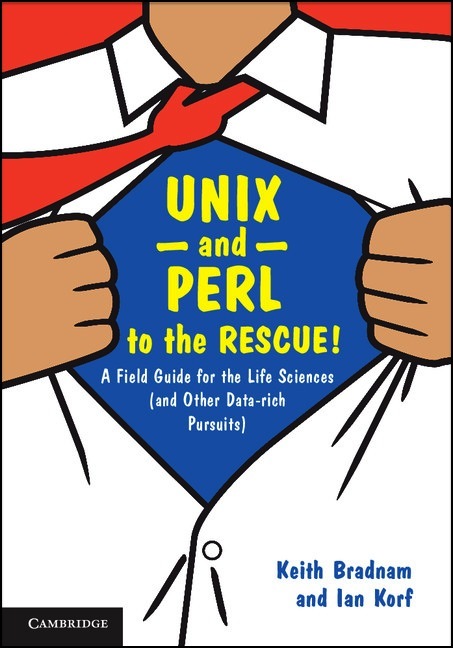 Unix & Perl to the RESCUE! Our book that greatly expands on our free primer. Contact information for specific members of our lab can be found on their personal pages.